I had the pleasure of meeting with Joanne Clarey for lunch one afternoon. We went to Aunny’s on Front Street. I’ve known Joanne since we worked together at the detention center many years ago. I was a nurse; she was just starting out as a correctional officer. I have always enjoyed her company. Joanne has a bright (and quick-witted) sense of humor. As my friend and neighbor, I invited her to lunch with me so I could finagle a story out of her about herself for my “Meet Georgetown” segment. “And now? You’re no longer a CO (correctional officer),” I asked. We talked for a long time and reminisced about different officers and inmates we knew. We agreed it was such a small world because we also knew so many of the same people on the outside. We know them in different ways and yet amazingly, see them in the same light as one another. For instance, Joanne knows the girl who was once my maid of honor at my wedding and knows her children. Another thing: Joanne and I have daughters who grew up together. We know them, respectfully, and some of their friends. It is something to think about. One day our daughters were teenagers having adolescent problems: boys, parties, and sleepovers and now, they are grown, married and have very adult lives. 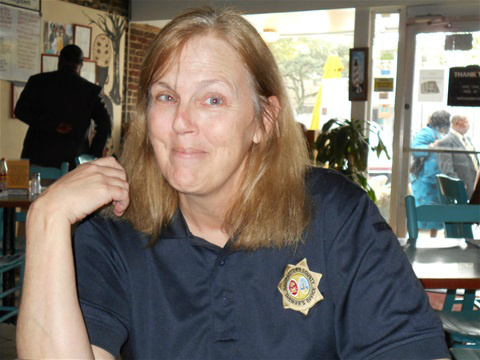 Professionally though, Joanne has always wanted to be a teacher and although she almost fulfilled her dream, she ended up being involved with law enforcement instead to some degree most of her adult life. I could see her being a teacher though. She’s very gifted with people. She has a caring side, a funny side, and she’s a sound thinker. Law enforcement was her destiny, as it were, since she was married to two different police officers, she worked as a 911 dispatcher for a while and now she’s part of the administrative staff at the detention center. “One of the most memorable calls I can remember, while working for the 911 dispatch, was a man who called me about his legs,” she says laughing. “What about his legs,” I asked. Joanne shared with me that not only is she a mother of four; she’s also a grandmother of eleven children. Recently, she and her sister implemented a plan called, “Operation Katherine,” where they intended on getting their mother to Connecticut so she could meet her first great-grand daughter. As I said, quick thinker, caring, and funny. You have to smile at the name “Operation Katherine.” That’s original. It is very Joanne-ish. I wouldn’t expect any less, either. Alas, our lunch at Aunny's came to an end. I enjoyed catching up with her so much that, I forgot to take many notes. Nonetheless, I was able to remember a lot of the material. Joanne Clarey makes a very nice addition to Georgetown and I thank her for the opportunity to write about her. Most of all, I’d like to thank her for being my friend. She is a treat.